Yesterday, we celebrated a milestone! 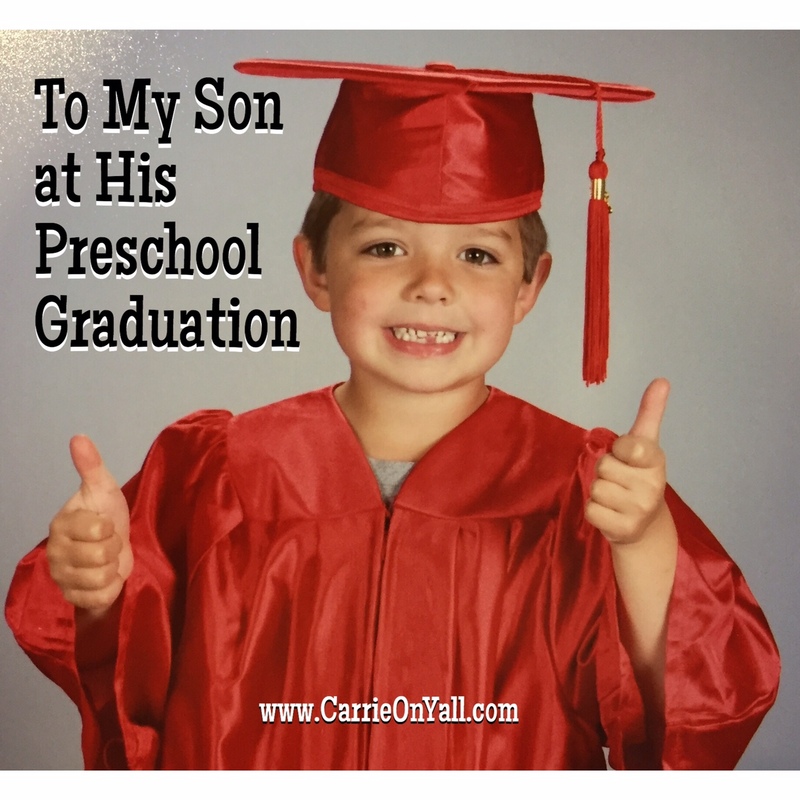 You graduated…from preschool. Your teachers put you in a silky red polyester cap and gown, had you and your classmates perform cute songs, and had you walk across the stage as your Director called your names. They even played “Pomp and Circumstance,” although I’m not sure what’s so pompous about learning your ABCs, your colors, and not to hit your neighbor if he says dinosaurs are better than sharks (true story). I’m also going to celebrate this accomplishment and take a little credit. When you flooded our house at Christmas with excessive paper in an upstairs toilet, I was relatively calm (after a few glasses of wine). When I’ve found paint on the walls, toys floating in toilets, and my entire linen closet emptied in favor of creating a fort that you play with for eight seconds and walk away, I have (mostly) kept it together. When you have scaled the shelves of our pantry after I said “no” to your 10th snack in fifteen minutes, I have disguised my inner monologue (for the most part). When you have terrorized your brother and sister and started fights that only the savviest of stinky brothers could, I’ve realized that you’re one of the few people in the world who can push my buttons so adroitly that I can go from zero to crazy, cussing, unrecognizable nutcase in six seconds flat. That is talent, my friend. And here you are. You don’t look like a baby, my baby, anymore, and I wonder when that happened. I’ve been here the whole time, on the front row, on the front lines, and yet I’ve somehow missed it. You’re tall and handsome, you’re smart and funny, you’ve been riding your bike without training wheels for a year now, and I’m about to send you to kindergarten. I’ve dreamt that, when I send you into the elementary school down the street, I would do a touchdown dance in the parking lot before I sped out of there on two wheels, but as that August day looms closer, my feelings are more complicated than that. I was so ready for you to leave these childish antics behind, and now that you have, now that you won’t be around to sit in your pajamas and cuddle with me on the couch before we get our day officially started, I’m sad. All of the sudden, those days that I wished away…won’t come again, not like this. Everything is about to change, and though change is inevitable, I’ll miss this. I’m so excited to have the front row seat on your life, and we will figure out how this new balance will work, and you will still be my guy, and I’ll be your girl. 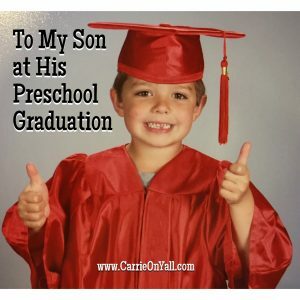 So as I watched you walk across the stage and receive your preschool diploma, I knew that there would be many accomplishments and honors to come. Like all parents who watch their children parade in a cap and gown to “Pomp and Circumstance,” I felt a mixture of joy, pride, and sadness that one door is closing for good, but another is opening.